President Donald Trump's second Mar-a-Lago summit with Japanese Prime Minister Shinzo Abe has been replete with memorable moments that appeared to underscore the harmonious relationship between the two leaders. And despite their warm body language and insistence on the valuable partnership between their two nations - along with Abe's effusive praise of Trump's handling of the North Korea crisis - when the subject turned to trade, the responses from the two leaders became considerably more muddled. While both leaders expressed a desire to work together on a trade, Trump stuck to his administration's line about preferring bilateral agreements, while Abe said Japan is still urging the US to rejoin the TPP, which Trump famously pulled out of during his first week in office. "The United States is committed to free, fair and reciprocal -- very important word -- trade. And we’re committed to pursuing a bilateral trade agreement that benefits both of our great countries," Trump said during a joint press conference with Abe at the end of a two-day summit at Mar-a-Lago, the president’s Florida resort. Abe responded by saying "I am aware of U.S. interest in a bilateral deal. But we want to approach the discussions from the point of view that the TPP is best for both of the countries," referring to the Trans-Pacific Partnership trade deal that Trump pulled the U.S. out of in his first week in office. Japan is the US's fourth-largest trading partner, swapping $200 billion in goods and services annually. In 2017, the US ran a $70 billion deficit, which Trump decried as "not fair". The dispute between the two allies is fundamentally about how they see that status quo on trade. 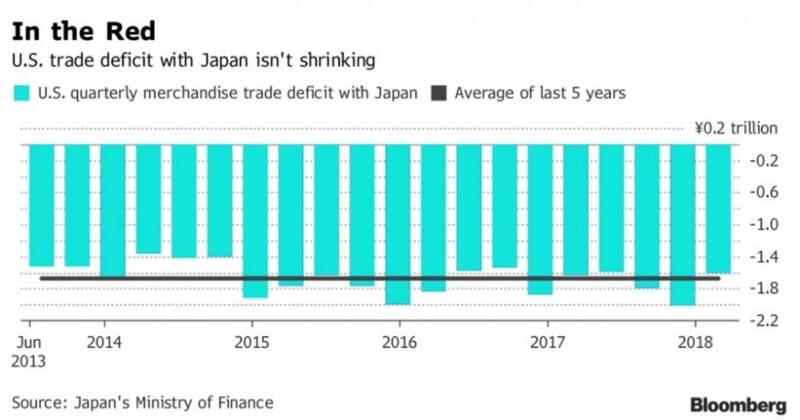 Trump is pushing for an agreement that would reduce the U.S. trade deficit with Japan, while Abe is basically seeking a return to the situation before Trump became president -- with the U.S. leading TPP, and no extra tariffs on metals that Trump announced last month. ...And this fact hasn't been lost on diplomats and others. One former ambassador even called the agreement "a little incomprehensible." "Was there really an agreement on a trade deal? Was it the same as an FTA? Or was it some deals in some sectors? We have to watch and see," Ichiro Fujisaki said on Bloomberg TV. "From a Japanese point of view, just to lift tariffs on steel and aluminum, which are not huge exports from Japan, doesn’t balance out with a new trade FTA." To be sure, there have been some signs of progress on the trade subject - though they've been fairly small and remote. The Motegi-Lighthizer discussions will be part of the current economic dialogue between the two nations. That was announced in February 2017 just after Trump came into office, and is led by Japanese Finance Minister Taro Aso and Vice President Mike Pence. It has met twice, and while it hasn’t produced major results, it has resolved some outstanding trade issues. After the second meeting last October, restrictions on Japanese persimmons and U.S. potatoes were removed, and Japan promised to streamline some auto testing procedures. But complicating factors abound. Probably the biggest is whether Trump even grasps the subtleties of the various paths laid out before him. Earlier this week, Trump tweeted that "While Japan and South Korea would like us to go back into TPP, I don’t like the deal for the United States..."
However, South Korea isn't a part of the TPP - and it never was. Which begs the question: Is Trump's rhetoric about possibly returning to the TPP "if we can get a deal" just an entree toward the US's inevitable reentry? With China continuing to slap tariffs on US goods (most recently on imports of sorghum), the trade spat between the world's two largest economies is still simmering. Perhaps the administration is coming around to the idea that it might be in the US's interest to rejoin a free-trade framework that would, if nothing else, at least counter China's expansionary interests.